Sanding procedure that we perform is usually with a dust containment system to minimize the dust from going thru out the home. Our sand and refinish process includes sanding the wood floors down to the bare with 2 or 3 sand papers 36,40,80 grit sand papers we then fill the wood floors for cracks and buff out the floor with a flooring buffer using a real fine sand paper kinda like a window screen this takes out all imperfections that may have been left from the floor sander and creates a smooth mirror like surface that closes the wood grain thus allowing the stain not to penetrate deep in the wood flooring. 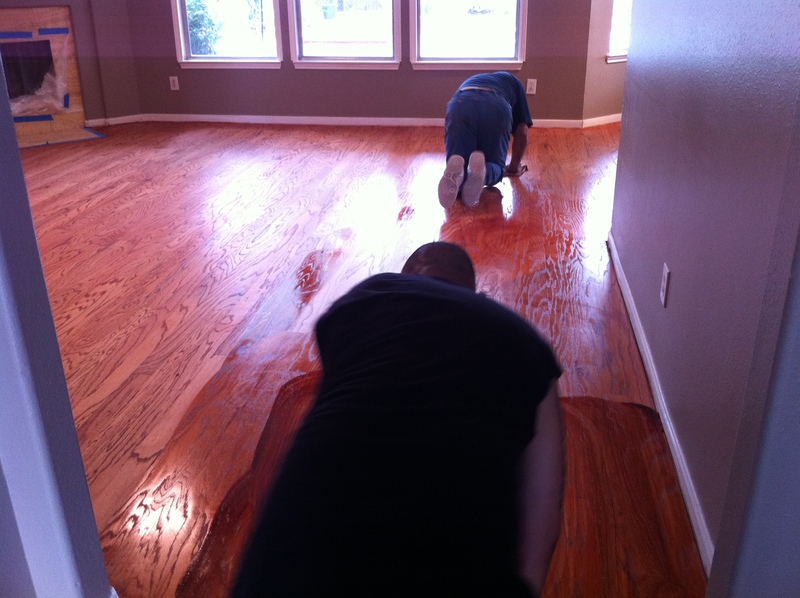 After the wood stain has dried with then apply two coats of oil base polyurethane of course lightly sanding in between the two coats and proceed to finish the wood flooring with new shoe molding and transitions strips. We then remove all debris like plastic we would have placed in door ways to stop dust from traveling thru out.